12-year-old boy gunned down and killed for playing with toy gun. As the nation quietly awaits a potential riot-starting decision in Ferguson, Missouri, a horritically tragic story erupts from Cleveland, Ohio. 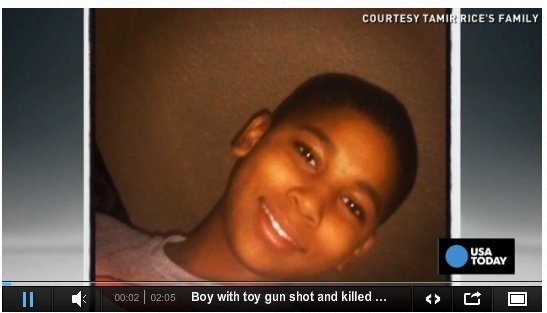 Sources report that police in Cleveland shot to death a 12-year-old boy who was playing with a toy gun. A phone call was placed to police dispatch that reported a ‘juvenile’ was waving around a gun and scaring people with it. The caller reported that they thought the gun was fake. The county’s medical examiner identified the child as Tamir Rice. He was shot in the torso and died from his wound. Police are claiming that officers responding to the call were never told the gun was fake.